Apart from the claim that “Allah” is the name of the moon god, the Christian missionaries also tend assert this claim by questioning why the crescent moon in Islam is used as a symbol to represent the religion, or why is the crescent moon or full moon used in Islam to mark a new month in the Islamic lunar calendar. 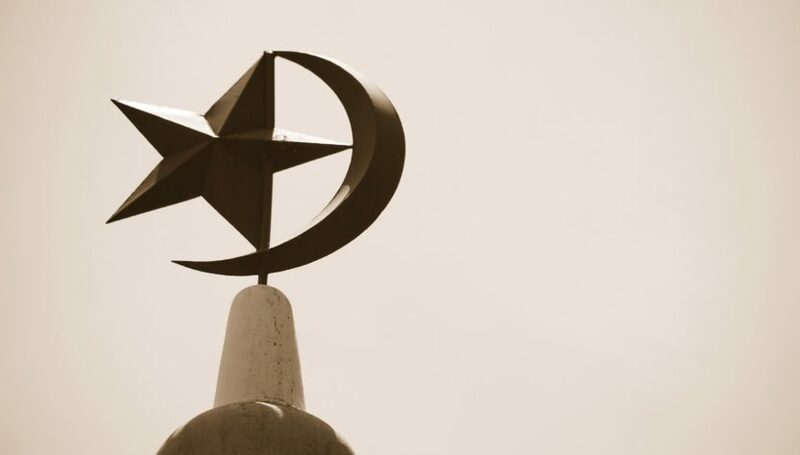 They engage into the logical fallacy of equivocation to justify their allegation; since Muslims use the crescent symbol to represent Islam, it therefore also follows that Muslims worship some kind of “moon god” and Islam is the religion of the moon god. However, this is no more truer than claiming that since Judaism adopts the Star of David symbol, it follows that the Jews considers it as an object for worship, or that Christians worship the Crucifix since it is used as its symbol. 1 Does The Crescent Symbol Represent A Deity? Does The Crescent Symbol Represent A Deity? However, let us now look at a different approach to the issue, i.e. the purpose of the moon in Islam, and a comparison of this with the other Abrahamic religions, namely Judaism and Christianity. This paper will attempt to explain the significance of the crescent moon in Islam and repudiate the idea that Islam condones moon worship, insha’Allah. So what is the function of the moon in Islam? The only function it plays in Islam is that it determines the Islamic lunar calendar. The Qur’an confirms this when it speaks of the moon being subject to God’s Law. If Allah” (God) is indeed the “moon god” as claimed by misguided Christians, why would that very same “moon-god” create the moon for the use of mankind? In short, the claim that Muslims worship “Allah the moon-god” simply because of the crescent symbol is nothing but a heinous lie which is not based on any concrete evidence. The moon also plays an important role in a symbolic comparison with the Jewish nation. We reproduce below an article written by Rabbi Avrohom Berger that states as such. 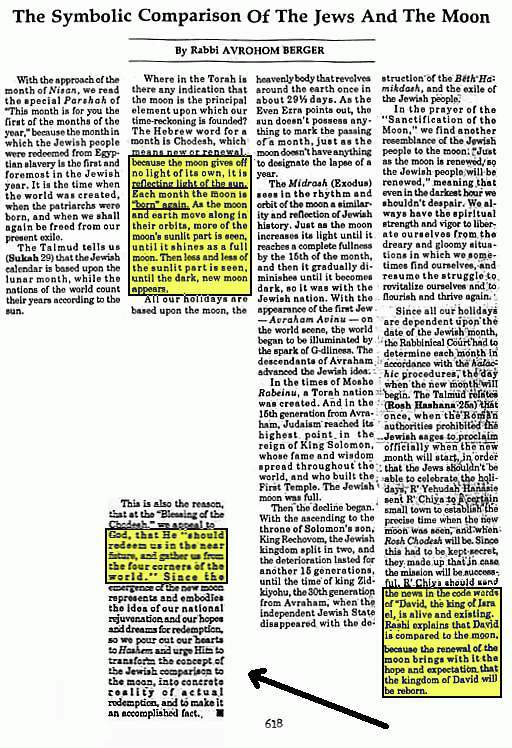 The article above would clearly refute the nonsense that Islam based its calendar on the moon because it was a religion of the moon god, for if Islam was really the religion of the moon god, what is the religion of the Jews who used (and still use) the lunar calendar and constantly analogizes itself to the moon? Condemning the Jewish religion as “moon worship” based on the “logic” (or rather, the lack of it!) of the Christian missionaries would, however, lead to serious implications that could undermine their own faith, as Jesus(P) was a learned Rabbi and faithful Jew himself. However, they have no qualms condemning Islam for using the lunar calendar. Such double standards are not alien to Christian thought, after all the end justifies the means, just as Paul did the same. We have seen that both Judaism and Islam, as in the tradition of Semitic culture, use the lunar calendar to mark their months. The question now is why Christianity adopted the solar calendar, instead of the lunar? The cult of the sun-god was the most popular creed at the advent of Jesus(P) and was prevalent in all the countries into which the religion called “Christianity” was later introduced in. Pagan gods such as Apollo or Dionysus among the Greeks, Hercules among the Romans, Mithra among the Persians, and Osiris, Isis and Horus in Egypt et. al., are all sun-gods5. In the face of the evidence, one cannot help but conclude that the adoption of the solar calendar is certainly due to the strong Hellenistic influences of the sun-god cult during its adoption. It is clear that the creation of a calendar is for the purpose of keeping time in perspective. Time is measured in relative terms, from sunrise to sunset; from the time the sun casts the shortest shadow to the same time the next day; from one harvest time to another. In ancient times, the phases of the moon were an easy means of measuring the passage of time. The first calendars were lunar calendars. Ancient civilizations such as the Assyrians, Babylonians, Egyptians and the Chinese used the lunar calendar. Consequently, the Semitic culture also adopted this calendar which includes Judaism and Islam, with the exception of Christianity using the solar calendar due to pagan Hellenistic influences from the Greco-Roman culture. Clearly, the purpose of the crescent moon in Islam is nothing more than to keep track of dates and months as Islam adopts and utilises the lunar calendar. In light of this fact, Islam, therefore, uses the crescent symbol to represent the religion graphically. There is no logical reason to associate the lunar calendar of Islam with moon worship. I had never heard the claim that Muslims worship a moon god, but I guess people come up with all kinds of nutty things. I’m a Christian but I’ve read the Q’uran and know it does not endorse worship of any object. The adoption of a solar calendar by the Christians was not a matter of sun-worship either. Julius Caesar established an updated solar calendar that became the standard for the Roman world before the birth of Christ. Christianity grew up mainly in this world, and adopted the same calendar largely without premeditation…it was just the normal calendar for most of them. There was some early dispute between those in the western half of the empire and those in the eastern half over setting the date of Easter…the eastern churches insisted on following the Jewish Passover date, which meant Easter happened at a different time of year every year, while the western churches insisted on setting a specific date in the Roman calendar and sticking with it. Probably a more rational, if less biblical, decision. After Constantine, with the church tied more closely to the empire, dating followed the imperial calendar, which was Julian. Festivals were placed to correspond with pagan festivals in some cases (Christmas, Easter) in order to support evangelism. The concept of Trinity has been dealt with here. You don’t know much about Islam, do you? Muslims don’t fast for “48 hours” without stopping and the injunction for fasting in Ramadhan came long after the Prophet Muhammad arrived in Madinah. The Caliphate was established only after Muhammad’s passing. A lot of anachronisms in your “comments”: I suggest that you take your own advice and learn about the basics of Islam first before commenting again! Why would God pick a worthless man to be His new leader (Muhammad), then declare war on the world to erect a caliphate, yet you can’t believe the God would choose to walk in this world in the flesh. Yeah yeah, 1+1+1=3, but what does 1*1*1=? What is 1^3? You set limits on your god, believing some “hustler” who took the best of Judaism and Christianity, and denounced a only a few things to make his religion better. Don’t believe me? What about when Muhammad arrived at whatever holy city it was, asked the Hebrews “what are you doing?” When they said they were fasting for 24 hours, instead of saying “we will fast with you and worship the one true God,” he instead said “we’ll do it better. We will fast for 48 hours.” Islam is a bunch of one uppers that think they can get to “paradise” if they follow the whole Quran to a T, but only God judges ALL THINGS. You may be a perfect Muslim, and yet you may be kept out of Heaven because you failed to understand that everything is the will of God, including your salvation. God Bless you and your family, and read a bible some day. I pray you understand your place in this universe. It is whatever God wants from you. Jesus is the Sun of God? – And, although the statue of Jesus replaced the idol of the Sun-god, decided to incorporate all the ceremonies which were performed at the Sub-gods birthday celebrations into their own ceremonies. How can they accuse others of moon worship ?